Faith Formation is designed to enable opportunities for children and adults to grown in their knowledge of God and the Catholic Faith. We prepare for and celebrate the sacraments, as well as liturgy, service, prayer, scripture and the lives of the saints along with art and music activities. our focus is learning our faith as we life it, in the midst of a celebrating community that proclaims Jesus’ message in Word and Action. Registration material for Faith Formation classes is available online. Please register by June 28. Click here to register on-line now. Many volunteers give generously of their time and talent to pass the faith onto our children. Our program is quite large. Each year, over 50 dedicated adults teach about 340 students in 25 classes. All our teachers are required to be VIRTUS trained to help ensure the safety of our children. More volunteers are always welcome to teach or aid in other ways. Volunteer now by completing the on-line Faith Formation Volunteer registration form. Click here to volunteer on-line now. The parish community of the Church of the Holy Family is committed to a faith formation program that will enable each child to grow in faith and relationship with Jesus. Our programs meet and follow the official statement on Catechetics of the National Conference of Catholic Bishops. Our curriculum is designed to follow a sequential pattern of faith and moral development and is structured on sound theological principles in accordance with the National Catechetical Directory. Classes for all grade levels consist of class time, service opportunities and exposure to some traditional Catholic devotions and events. We encourage parents/guardians to take an active role in their children’s religious growth. Faith is God’s gift, but the nurturing of that gift goes on mainly in the day-to-day living of family life. Our goal is to help children develop into faithful Catholic adults. Direct preparation for these sacraments is done in the second grade after a child has attended at least one year of Faith Formation classes. Classes meet from 6:00 – 7:30 PM on Monday evenings. Children prepare for and receive First Reconciliation in the fall. They begin classes for First Eucharist in January and receive this sacrament in early May. 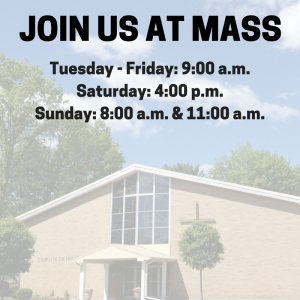 Classes for grades 9 and 10 are 12PM-1:30PM on Sundays on alternating weekends. Confirmation candidates are expected to participate in a total of 10 service projects over the course of 2 years (9th and 10th grade). Each year candidates are expected to do 4 (four) service projects within our CHF parish and 1(one) within the greater community. For more information about service requirements, click here. The service reflection and evaluation form is available here. Classes for grade 10 are 12:00 PM – 2:00 PM on Sundays on alternating weekends. Confirmation in the Diocese of Syracuse is generally received in grades 10 or 11. This program consists of classes, a retreat, and service. The sacrament is usually conferred in the early Spring. Confirmation candidates are expected to participate in a total of 10 service projects over the course of 2 years (9th and 10th grade). Each year candidates are expected to do 4 (four) service projects within our CHF parish and 1(one) within the greater community. For more information about service requirements, click here. The service reflection and evaluation form is available here.